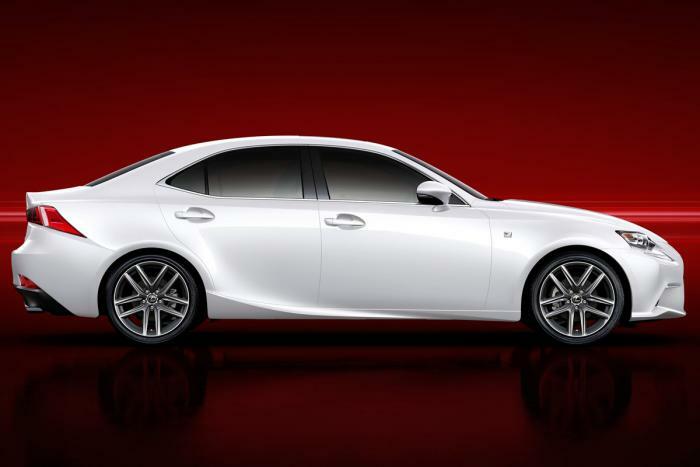 The car that completes the gradual hybridisation of the Lexus range. The new IS executive saloon becomes the final piece of the jigsaw. There now isn’t a model from the Japanese luxury brand that doesn’t come with at least the option of petrol-electric power. The firm’s flirtation with diesel is over. A few petrol-only models remain, but they’re dwindling in number. And so – 14 years and three generations into the life of the car that really launched Lexus as a fully fledged European premium automotive brand – ‘Hybrid Synergy Drive’ becomes the weapon that parent firm Toyota wields for a renewed assault on the BMW 3-series, Audi A4 and Mercedes C-class. It’s a bid that should attract plenty of attention – albeit, says Lexus, perhaps only five thousand UK sales in a full year. Having added 75mm to the overall length of the IS saloon, and taken the usual painstaking approach to redesigning it from top to bottom, Lexus has developed an all-new hybrid powertrain for the IS saloon, which mates a 2.5-litre four-cylinder 178bhp Atkinson cycle petrol engine with a 141bhp electric motor, both feeding the rear wheels. The IS300h’s petrol engine, like all of Toyota and Lexus’ hybrid motors, runs on the Atkinson combustion cycle for a high expansion ratio and increased efficiency. Fitted with a new fuel-injection system with injectors positioned both in the chamber and in the port, it also has exhaust gas recirculation for reduced operating temperature and high thermal efficiency. There are low-friction piston rings fitted, as well as a low-friction timing chain, low-friction valvegear, and an intelligent oil pump. It runs at a very high compression ratio of 13.0:1. Meanwhile, power for the 141bhp, 221lb ft, rear-mounted electric motor comes from a 230-volt, 192-cell Nickel-Metal-Hydride battery pack. It’s satisfying to find the IS300h free of many of the compromises we’ve seen in hybrid saloons before. In entry-level SE trim, it’s hardly any more expensive than a mid-spec 2.0-litre diesel Audi A4. No longer must owners stomach an unpalatable premium for the privilege of occasional zero-emissions running. The performance stats are competitive, too. The boot is all-but as large and usable as any rival’s. And then come the numbers to really lure you in: 99g/km of CO2 and 65.7mpg on the combined cycle. The former stands to save a company car driver three figures on his annual tax bill, even compared with an equivalent BMW 320d Efficient Dynamics, via Benefit in Kind liability at just 11 per cent. Yet in spite of the headline-making efficiency it offers, the new IS300h isn’t a martyr to the cause. Apparently. “It’s a car to change your mind,” says Toyota head honcho Akio Toyoda – about hybrids and about Lexus. Using new joining techniques and lightweight materials, the company says it’s added significantly to the torsional stiffness of the IS’s body-in-white without adding to its weight. Stiffer anti-roll bars make the car 20 per cent more roll-resistant at the front axle, while a new multi-link suspension set-up has added 15 per cent more grip at the rear. New steering and braking systems are alleged to bring quicker response, smoother control and greater feedback.